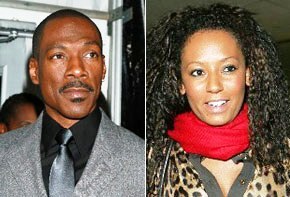 In a statement released Thursday, Melanie Brown, 31, stated, “I am obviously upset and distressed at some of the comments made by Eddie Murphy to the media…I have no idea why anybody would want to conduct themselves in this kind of manner about such a personal matter in such a public way.” Brown, who is in her second trimester, went on to say, “My main concern is for the well being of my (seven-year-old) daughter Phoenix and of course the baby. I was astonished at what Eddie said – there is absolutely no question that Eddie is the father.” This is the first time Melanie Brown has publicly acknowledged that she is pregnant. Perhaps Melanie Brown should call up Mary Louise Parker who was pregnant when Billy Crudup dumped her for Claire Danes. Or she can call Shar Jackson, Kevin Federline’s ex-girlfriend who was ready to pop when he dumped her for Britney Spears. I suppose Mel B could call Charlie Sheen who was dumped by Denise Richards when she was pregnant, but that’s a bit different. previous post: Celebrity Morgue – Creepy Or Cool? 48 queries in 0.730 seconds.